As of September 4th, 2012, the EIT Help Desk has moved their main office from the Kim Engineering Building to 0123 Glenn L. Martin Hall. However, the Help Desk will also continue to maintain a presence in the Kim Building for daily support and special events in Room 2118. 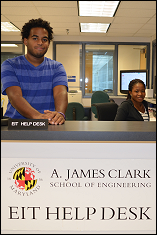 To contact Help Desk staff, you may call 301-405-1634, email eit-help@umd.edu, or stop by one of the Help Desk locations.